But, you know what, they might not taste so bad. Right? Right?? C'mon, let's just be glad this isn't orange and toothpaste. 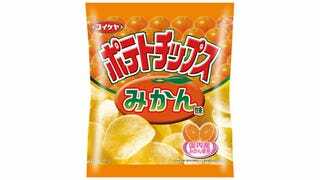 Later this month, "mikan" (orange or tangerine in Japanese) potato chips go on sale nationwide in Japan. Actually, they'll be out December 22, reports Street Girls Snap. The chips are from snack company Koikeya, and, I dunno, I've had lemon-flavored chips. They were okay! Maybe these will be alright. Apparently, they combine a citrus taste with the slight sweetness of oranges in potato chip form. Um, okay! And yes, actual Japanese mikan are used to make this snack. The reason, however, for the December release is that during winter in Japan, people traditionally eat mikan. So, these are very much a seasonal flavor. Koikeya has been rolling out these chips in select locations across Japan, evoking bewildered responses from Japanese Twitter users. The consensus among Japanese Twitter users is that orange flavored chips sound disgusting. Even knowing that, people in the test areas report that they ended up buying the chips. Heh. Interestingly, these are not the only orange potato chips in Japan. There's a local brand in Shizuoka that some people say has a faint orange taste. Others call them "way too gross." I'm sure these chips will have their fans. Perhaps I will be one of them... Perhaps not.